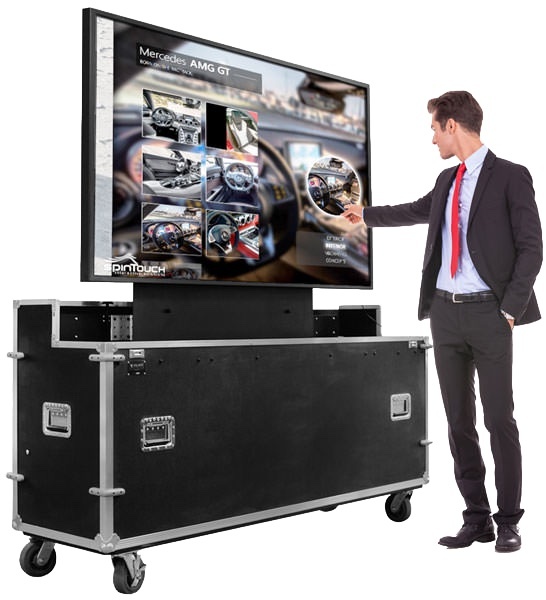 Mobile video walls and touch screen monitors that are easy to move from room to room as well as pack to relocate for trade shows and events. With these systems, setup times are measured in minutes rather than hours and do not require specialized expertise. In addition, LTE remote media connection and update is available. LED video wall displays made up of free standing wheeled sections that can be used individually as posters or secured together to create a single large video wall. Excellent for interactive presentations and showcases. Available with a 55" or 65" 4K touch screen monitor the Forza takes only a few minutes to get up and running. Using 55" LCD narrow bezel monitors this is a cost effective route to a rapid setup 2x2 video wall. .
Monitor Size 60" x 35.4"
Shipping Dimensions 86" w x 24" d x 65"